I was totally blown away by this book. I picked it because I thought it had a cool premise, but as I started reading, each chapter drew me deeper in. I had one guess at where Ozzie was coming from, but it didn't really fit and turns out I was way off base. Ozzie and Tommy had been in a relationship after knowing each other for most of their lives. One morning, Ozzie wakes up and Tommy has disappeared, not just from his life, but from the world. No body knows nor remembers him, not even his mother. As he continues to tell his story, we soon learn that something is very wrong, not with anyone in particular, but with the world it's self. I loved the assortment of teen characters in this book. They seemed so real. They had love issues and stresses. School was still the pain it was in when I attended and college acceptance letters were still pending. Ozzie has no trouble with being gay, while Lua is exploring her identity, swinging daily between her male and female persona's. I fully recommend this book for teen readers as well as their parents. 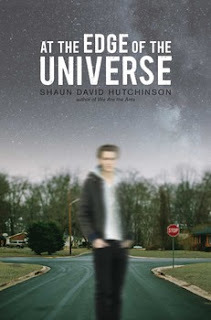 I am looking to reading more by author Shaun David Hutchinson. I read and online version of this book available from Rivited which is hosted by Simon Pulse.